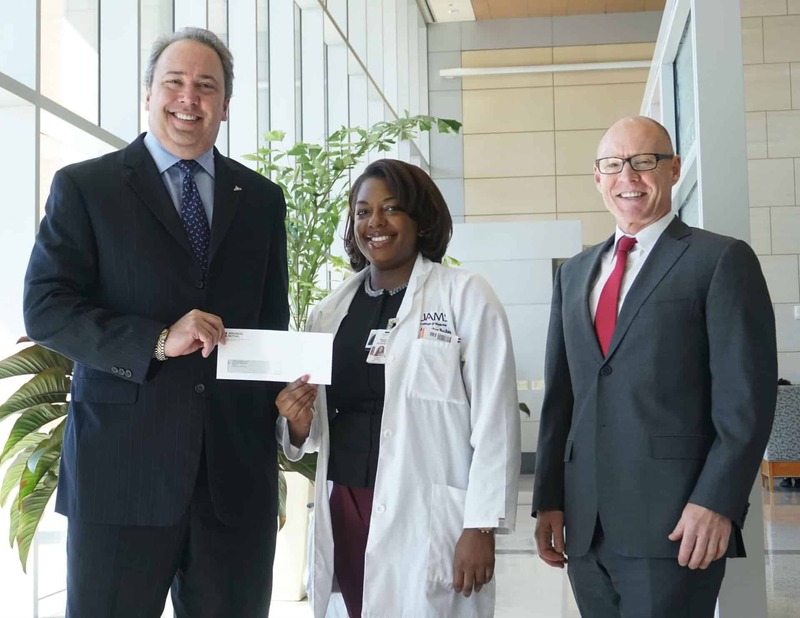 Corey Little, president of Arkansas Mutual Insurance Co.; College of Medicine student Jacquelyn Bailey of West Memphis; and Pope L. Moseley, M.D., UAMS executive vice chancellor and College of Medicine dean. Oct. 26, 2017 | Oct. 26, 2017 — Jacquelyn Bailey of West Memphis has been awarded the Arkansas Mutual Medical Student Award, a scholarship for third-year medical students at the University of Arkansas for Medical Sciences (UAMS) who want to practice primary care in rural Arkansas. Bailey, a first generation college graduate, found her inspiration for primary care as she learned about her grandmother, Beatrice Henderson, who died when Bailey was barely a year old. Bailey keeps a medical record of her grandmother’s that shows she had three children, but also five stillbirths. “As I thought about the period in which she lived, my heart became heavy because I knew this was the fate of many black women like her,” she said. Bailey said that she intends to practice family medicine in West Memphis. With a background in epidemiology from the UAMS Fay W. Boozman College of Public Health, she intends to emphasize disease prevention programs to improve community health. Corey Little, president of Arkansas Mutual Insurance Co., the only medical liability insurance provider headquartered in Arkansas, said the company is deeply committed to improving rural health care in the state. More than two-thirds of Arkansas’ counties include federally designated Primary Care Health Professional Shortage Areas. Primary care physician shortages are projected to increase substantially as the state’s population continues to age and require more medical care, and as more Arkansans, now insured as a result of health system reform, seek primary care services.